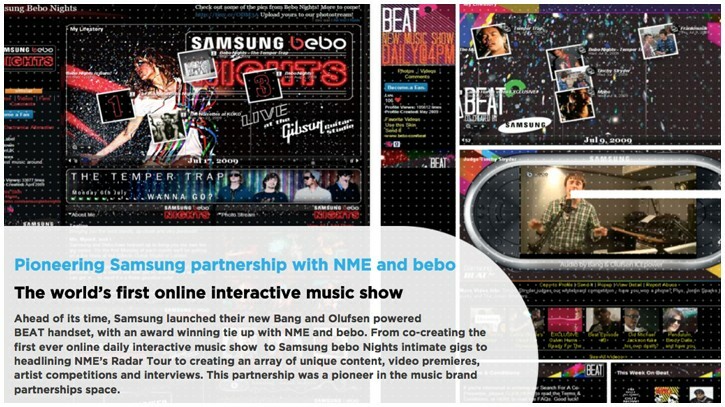 Pioneering Samsung partnership with NME and bebo - We Are Fearless | Boldness with backup. Ahead of its time, Samsung launched their new Bang and Olufsen powered BEAT handset, with an award winning tie up with NME and bebo. From co-creating the first ever online daily interactive music show to Samsung bebo Nights intimate gigs to headlining NME’s Radar Tour to creating an array of unique content, video premieres, artist competitions and interviews. This partnership was a pioneer in the music brand partnerships space.